To send us image scans by email, please send to the email address below. Jefferson, left. Statue of Liberty, right. orange eagle and Columbia statue on back. Embossed large Treasury seal above register’s name. Second Liberty Loan Converted 4 1/4% Gold Bond of 1927-1942 (United States Government) 1918. $100. Coupons to the side and underneath. Brilliant yellow-orange underprint and "SECOND LIBERTY LOAN CONVERTED". Blue Treasury Seal. Andrew Jackson. Torch, bottom. Orange Columbia above Capitol with flag and Statue of Liberty on the back. Facsimile signatures of Teehee and McAdoo. Issued under the Act of May 9, 1918. 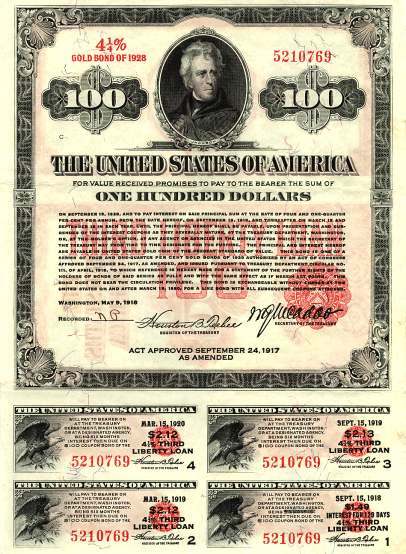 Third Liberty Loan 4 1/4% Gold Bond of 1928 (United States Government) 1918. $50. Red underprint and "THIRD LIBERTY LOAN". Blue treasury seal. Thomas Jefferson. Torch, below. Brown bald eagle on reverse. Facsimile signatures of Teehee and McAdoo. 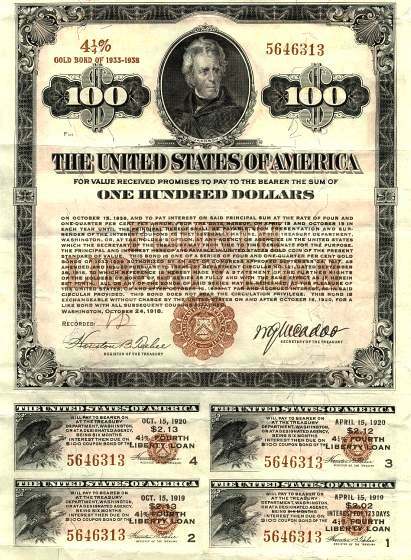 Third Liberty Loan 4 1/4% Gold Bond of 1928 (United States Government) 1918. $1000. Red underprint and "THIRD LIBERTY LOAN". Blue treasury seal. Abraham Lincoln. Torch, below. Green bald eagle on reverse. Facsimile signatures of Teehee and McAdoo. Approved under the Act of April 24, 1917 this Liberty Loan bond was authorized to raise funds to help win the first World War. Fourth Liberty Loan 4 1/4% Gold Bond of 1933-1938 (United States Government) 1918. $50. Green underprint and "FOURTH LIBERTY LOAN". Red treasury seal. Thomas Jefferson. Torch, below. Brown Justice on the reverse. Facsimile signatures of Teehee and McAdoo. Fourth Liberty Loan 4 1/4% Gold Bond of 1933-1938 (United States Government) 1918. $100.. Green underprint and "FOURTH LIBERTY LOAN". Red treasury seal. Andrew Jackson. Torch, below. Orange Justice on the reverse. Facsimile signatures of Teehee and McAdoo. Fourth Liberty Loan 4 1/4% Bond of 1933-1938 (United States Government) 1918. $500. Coupons to the side and underneath.Green underprint and "FOURTH LIBERTY LOAN". Red treasury seal. George Washington. Torch, below. Blue Justice on the reverse. Facsimile signatures of Teehee and McAdoo. Liberty Loan of 1917 (United States Government) 1917. $50. Blue "50 THREE AND ONE HALF PERCENT" and Treasury Seal. Thomas Jefferson, left. Statue of Liberty, right. Brown eagle and Columbia statue on back. Embossed large Treasury seal above register’s name. The original series of eighty coupons are bound to the side with none clipped. United States of America (USA) 1918. Third Liberty Loan.. $50. 4 1/4% Gold Bond of 1928. No coupons. Red "THIRD LIBERTY LOAN". Red treasury seal. Thomas Jefferson. Facsimile signatures of Teehee and McAdoo. United States of America (USA) 1918. Third Liberty Loan. $100. 4 1/4% Gold Bond of 1928. All four coupons attached. Red "THIRD LIBERTY LOAN". Red treasury seal. Andrew Jackson. Facsimile signatures of Teehee and McAdoo. These bonds were sold with only four coupons attached. United States of America (USA) 1918. Third Liberty Loan.. $100. 4 1/4% Gold Bond of 1928. All four coupons attached. Red "THIRD LIBERTY LOAN". Red treasury seal. Andrew Jackson. Facsimile signatures of Teehee and McAdoo. United States of America (USA) 1918. Fourth Liberty Loan. $50. 4 1/4% Gold Bond of 1933-1938. All four coupons attached. Brown "FOURTH LIBERTY LOAN". Brown treasury seal. Andrew Jackson. Facsimile signatures of Teehee and McAdoo. United States of America (USA) 1918. Fourth Liberty Loan. $100. 4 1/4% Gold Bond of 1933-1938. All four coupons attached. Brown "FOURTH LIBERTY LOAN". Brown treasury seal. Andrew Jackson. Facsimile signatures of Teehee and McAdoo. United States of America (USA) 1919. Victory Liberty Loan. $50. 4 3/4 Convertible Gold Note of 1922-23. Coupons underneath and to the side. Blue underprint and treasury seal. Thomas Jefferson. Brown eagle on reverse. United States of America (USA) 1919. Victory Liberty Loan. $100. 4 3/4% Convertible Gold Note of 1922-1923. Coupons underneath and to the side. Blue underprint and treasury seal. Andrew Jackson. Orange eagle on reverse. 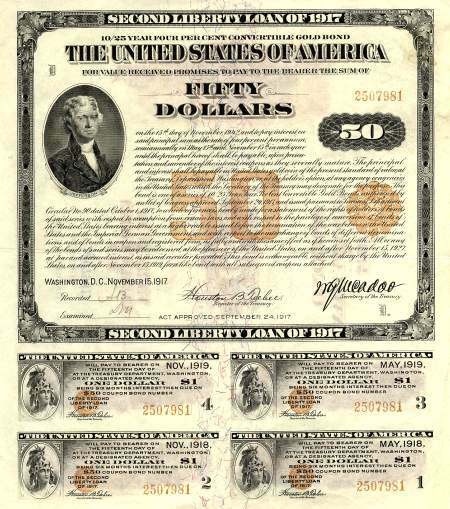 United States Government Liberty Loan Bond Specimen. $10. Participation Certificate. Brown. Eagle atop rock, left. ABN. United States of America 1918. Treasury Department Authorized Agent Certificate. Blue with gold highlights. Eagle with shield. Printed signature of McAdoo.